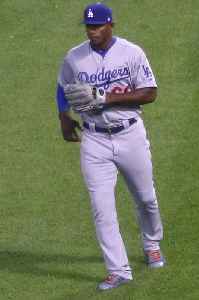 Yasiel Puig Valdés is a Cuban-born professional baseball right fielder for the Cincinnati Reds of Major League Baseball (MLB). He previously played for the Los Angeles Dodgers. His nickname is "The Wild Horse," given to him by former longtime Dodgers broadcaster Vin Scully. Puig is the all-time leader in postseason appearances for the Dodgers with 58. LEADING OFF: Red Sox get World Series rings, Yasiel Puig gets a new nickname, Jacob deGrom tries to stretch scoreless streak, Luis Severino returns to NY for more tests, surprising Tigers take on..